Pic of the week: "My Little Slave Pony"
The first person to die on the Marvel Comics Theme Park Spider-Man ride will probably get a slew of goofy titled obituaries like "Web-head Kills Local Rider" and "J.J Jameson Was Right: Spider-Man is a Menace". Actually...those are pretty good, so I'm going to file those for a future post. TOSS UP: If they do a hip-hop version of the original theme song should they use Jay-Z or Kanye West? Kanye would make it super-cocky, so I'd vote for Jay-Z to add some soulfulness. TOSS UP: Giger or Schumacher's "Batman Forever" Batmobile? While Giger's looks cool, it's way too complicated and preternatural. I reluctantly have to cast my ballet for Joel. OVER/UNDER: The image will get 6751 Diggs by the end of the month. I say OVER. With the "Red Hulk", "Red She-Hulk", "Savage Hulk" Skaar, Lyra and Hiro-Kala cluttering up the Marvel Universe, "The Fall of the Hulks" with finally put a end to the pandemonium. This will leave only the original Green Hulk, Gray Hulk, Mr. Fixit, Doc Savage and She-Hulk, which is much cleaner. 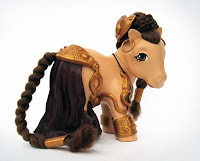 UPDATE: The "My Little Slave Pony" is actually one of many ponies created by a talented artist, Spippo. I like the "My Little Solo in Carbonite" the best. Thanks to Angie for the heads-up! 1. True. But why are we assuming someone will die on the ride? 2. I agree, the original "Greatest American Hero" series was a good idea poorly executed. I like your version. 4. False. I think the Alien prequel has room to work in, and the original will always be a classic. 5. False. Giger's Batmobile is too weird, but still way better than the blinged-out version Schumacher used. 6. Sorry, I'm too distracted to comment on the Leia photo...OVER. 7. True. When I heard about Hulk's son, I knew they had ruined the Hulk AGAIN. Just like they ruined Wolverine with his son. And Superman with his son. And...whatever. Hope they nuke 'em all. 5. I just wonder how can you shoot the Batmobile like that? Always from the top? 7. Moral of the story is that kids ruin everything! Just like the Mona Lisa! What is it with superheros having sons?? Why can't they just leave good enough alone?? @Angie Here's one thought: Why is it always sons? Why don't they ever have daughters? The little slave pony was distracting, but I got to see all the amazing ponies she did. LOL Thanks for the heads up!